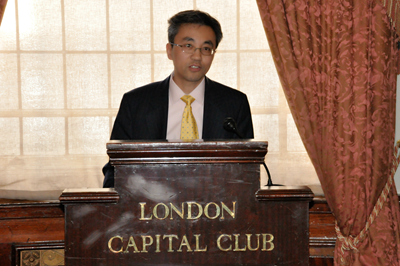 On 25 November 2016, Minister Zhu Qin attended and addressed the London Capital Club Luncheon. Sir Paul Judge, Director of the Rothschild Group, Mr. Anthony Belchambers, member of the Advisory Board of Financial Services Negotiating Forum of the UK, and more than 70 club members were present. Minister Zhu said that the uncertainties in the international situation this year were apparently greater than those in the previous years, but the China-UK relations post Brexit referendum remained stable, showing strong resilience. In the "Golden Era" of China-UK ties, major breakthroughs have been made in large-scale projects, and the Chinese companies have retained their enthusiasm to invest in the UK. With the concerted efforts of China and the UK, the bilateral relations will continue developing along the right track. Minister Zhu noted that China and the UK, as the second and the fifth largest economies in the world, are at different stages of industrial restructuring and transformation. The two economies can dovetail their respective strengths and enjoy broad prospects for cooperation. The "One Belt One Road" initiative, the Hinckley Point C project and other large-scale projects, and the outcomes of the China-UK Economic and Financial Dialogue provide excellent opportunities for the two counties to align their development strategies, to expand the trade, mutual investment and financial services cooperation, and to explore cooperation in third-party markets so that the China-UK relations will bear more "golden fruits" in the "Golden Era". Minister Zhu also answered questions on opportunities that the "One Belt One Road" initiative brings to the UK, the China-Philippines relations, and other issues.